Home Art	Schedulin Sunday: The First Day Of Kindergarten! Teachers, this is our SUPER BOWL! This is our moment. This is what we train for. And shop for. And rest all summer for. This is our Academy Awards. Our moon landing. IT’S THE FIRST DAY OF SCHOOL!!!!!! It’s the most important day of the year for us. It sets the tone for the year. It’s when we get to meet those amazing little humans that become our responsibility and our family. It’s when we meet the families that we get the honor of working with for the year. It’s when we start the 180 day countdown of growth and progress. IT’S THE FIRST DAY OF SCHOOL!!!! My district has a half day on the first day of school, the next day is a teacher work day and we return the following day for another half day. (Wednesday, Thursday, Friday). So we have two half days this week and the following week we kick off full days and a full week! So here’s what we have planned for our first half day! As the ‘staches arrive, they are of course greeted by me and they get a name tag and they find a place to work on their coloring pictures! They get to color a picture of me and some other back to school pictures! Then we come together for our first morning meeting where we learn each other’s names and we learn a little about our classroom and our teacher. This is also when we start learning the routines and procedures for putting away our carpets, clipboards and supplies. After our morning meeting, we sing our songs! We sing A Beautiful Day by Jack Hartmann and Alien Alphabet by Intelli-Tunes and Alphardy by Dr. Jean! Then we have our first read aloud! Miss Bindergarten Gets Ready For Kindergarten! After reading the book we make a list of all the things Miss Bindergarten’s friends do to get ready for the first day and we make a list of all the things WE do to get ready for the first day of school! After brunch, we work on our names! We all write our names on our class name chart! This will be up in our classroom all year long! We will do this activity again at Christmas break and the end of the year to show growth! Then we practice our names on our own. Everyone must write their name 5 times, no matter what. This provides me a great baseline and gives me great insight into where my ‘staches are! This is also when we go over our procedures for pencils and how we use them and how we don’t use them. This year, we’re making an anchor chart for each of our school supplies so this is when we get to make our first anchor chart! On our 2nd half day, the name writing is more differentiated and guided. I write the names with a highlighter to give some scaffolding for the kids. Then we learn how to use crayons. We will make an anchor chart for how we do and do not use crayons! 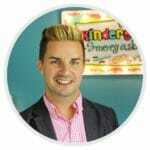 Mr. Greg will ask what the supply is (crayons) and what we use it for (coloring). Then I will break the crayons and we talk about what happened. Then we discuss what we can color (paper). And how we color. Then Mr. Greg models how to scribble and we discuss. Then Mr. Greg models how to color a soccer ball (in the lines, lots of colors, etc). And the kids get to use crayons to color their own soccer balls! And of course, our day ends with our first silly hat of the school year! Click the image to get your FREE hats for Pre-K, K and 1st grade! Of course, during this time we’re spending a lot of time on procedures for sitting on the carpet, lining up, walking in the hallway, using the restroom, etc! We will be using my Back To School Research creation to make our school supply anchor charts! 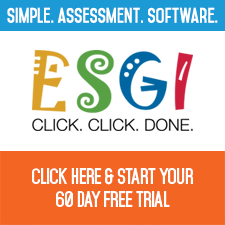 And be sure to check out ESGI to make your back to school assessments super easy! Click the button below to sign up for your FREE 60 day trial and save $40 off your subscription! Is there significance with the soccer ball or could your use another picture? Just curious. Any picture would work but I use the soccer ball because it has so many sections which encourages them to use different colors! You're my favorite go to site for ideas! I can always count on finding something good here. One of my many favorites is glue sponges – LOVE them. Do you start with fresh sponges and containers each year? Do you dive right in with Boot Camp? I feel like my first week has always just been survival and teaching them things like how to walk in a line and what to do at lunch. YEP! Throw them out and may and start over! We start on our first full week of school! I think starting the 2nd week is great! Where did you get your lesson plan template? And is there any way to get an editable version? I absolutely LOVE that layout! I had a question about the coloring you have them do when they come in the first day. How do you have them access the crayons- since you don't go over the anchor chart day 2? I was curious as to how you presented that. Thanks and good luck this year! It's available on the blog A Teacher's Plan! It's called THE GREG! I have the crayons out for them to use! The soccer ball activity is just to go over the procedures and expectations. They do a great job with the crayons when they first arrive! I love the way you hve planned out the whole year. Do you map out the science and social with standards as well? What do these anchor charts look like/have for wording. I am coming from 2nd grade and haven’t made anchor charts for a group of kiddos where the majority do not yet know how to read!